This lovely little tote bag was a gift from Nancy and Gene, who are quilters and computer/embroidery people who faithfully arrange for the local sewing/quilting gals who meet each month. I had admired this project during it creation and Nancy told me it was for her Mom. Is that a lie? 8-)) Thank you so much, Nancy and Gene - I LOVE it. 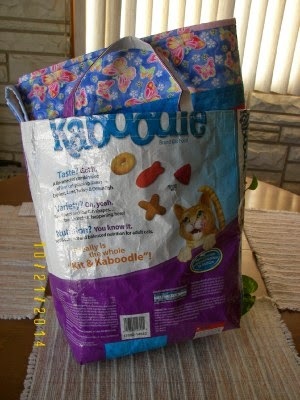 I've wanted to make a few tote/utility recycled bags from the amazingly strong large pet foods bags we see. They seem to be made of Tyvek or similar - hope I am using the right word. If you haven't made one, you will re-learn the word "wrestle" as the stuff is strong. You will need strong clips instead of pins. 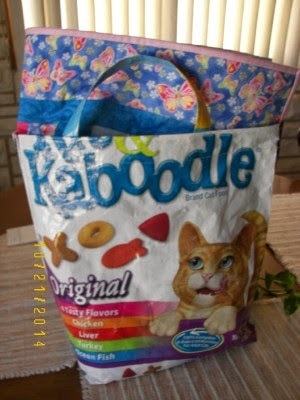 I wanted the cat to show, not necessarily the "Kaboodle". I stuffed a medium-sized quilt inside. I wiped out the inside of the bag with a damp cloth and lined the bag - lining was not necessary but seemed like a good idea. This can be used for my quilt basting supplies that currently hang in the garage. How about a strong book bag? Show and Tell? Here's the back. I squared off the bottom so it could hold a lot of groceries. Finished project is almost as large as a paper grocery bag. I was given 7-8 more bags, with dogs, horses or cows on them. My job would have been easier if I had used the free arm on my machine, instead of a flat surface. Instructions and great photos were found at blog.goodsmiths.com/. What would you use it for? Is it too dorky? Clever idea, but to be honest, I have way too many bags now, so tote patterns, no matter how clever, don't tempt me! The garage storage for your binding supplies sounds good. So we've come full circle from cotton feedsacks for quilters to Tyvek feedsacks being sewn into quilt bags and totes. Good for you! I repurpose trade show tote bags--the sturdy canvas or nylon ones--by covering the logo with a quilt block. 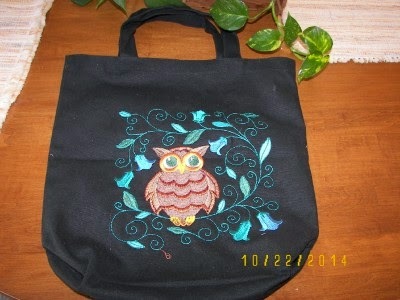 You can see examples on my blog (search "all posts" labeled "tote bag"). I think its a fun idea. In fact, I had the same idea and have saved a couple bags to use but just haven't gotten around to it yet.